Ever since the twins were born, our house has been changing rapidly. 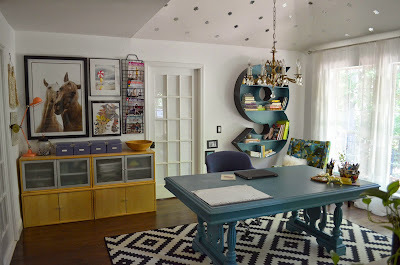 I plan to be back with a full post next week about how our home has changed since we had the babies that will summarize the differences in all of our rooms, but today I want to focus on the space that has undergone the biggest transformation: my office. While I was sad to give up my dedicated office space, I was excited to create the perfect spot to hang out with the twins all day. I still work from home a couple days a week, but now Scott and I share his office in one of the guest rooms. It's not my space anymore, but this room remains one of my favorite spots in the entire house, and I'm so happy we changed it to better suit our family. OK, let me start at the beginning. Ever since we fixed this room up as part of a blogging challenge a few years ago, this has been one of my favorite rooms in the house. It gets incredible light and I decorated it in a really fun style, a little more bold than the rest of the house. 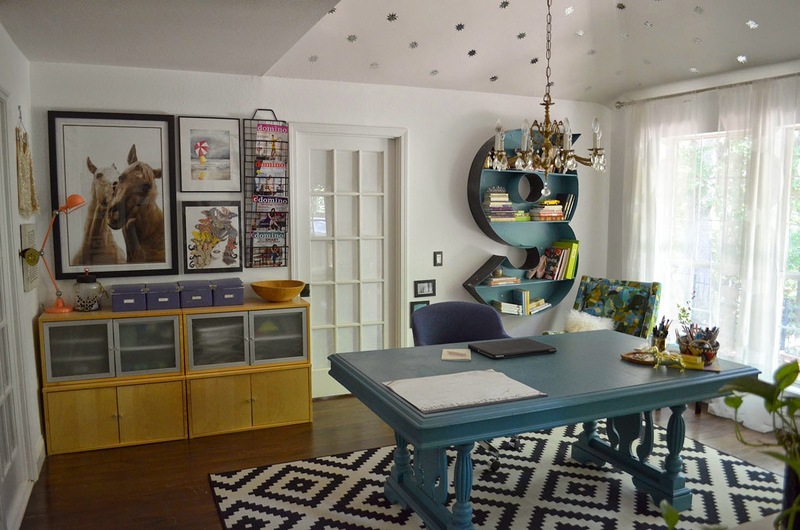 I always felt energized in this room, which is a great vibe for a home office. A lot of the touches I added for my office (sparkly stickers on the ceiling and letter bookshelf, for example) still worked perfectly for a playroom. But we did have to make several changes for functionality. Here's one of the parts of the room that is the same but different. See those cabinets? They are actually four random IKEA pieces we bought from the owner of our first house and have used in so many different ways. They used to be stacked in this corner, housing my art supplies. Now these cabinets are providing toy storage and an extra place to sit over by the windows. They're basically a makeshift window seat that we didn't have to build. Hooray! As for this corner, we ended up stealing the colorful dresser and DIY bicycle lamp from the nursery and putting it out here instead. 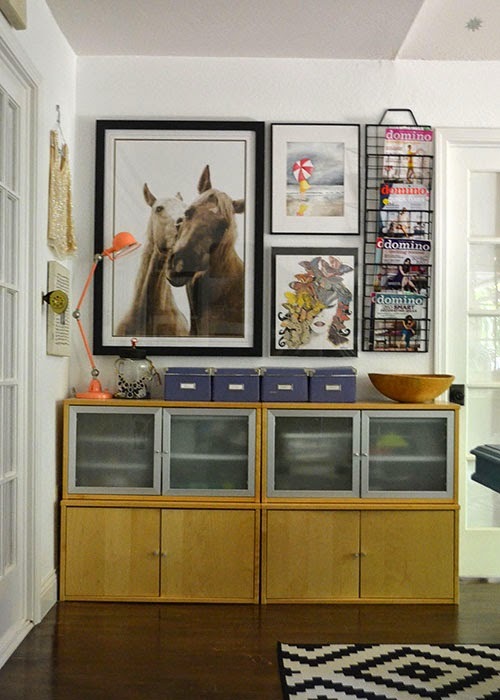 The horse photo and magazine rack stayed put, but we swapped out the magazines for books and added soft animal heads from Hobby Lobby instead of the previous art. Everything is super secured into the wall now because the babies kick and grab everything while they are on the changing table. Safety first! You may be wondering why we have the dresser and changing table in the playroom. I think this problem might be specific to having twins, but we found that we were never changing the babies in their room. We needed to have one play on the floor while the other was being changed, so the playroom was the natural spot to do everything. We also got them dressed on the floor of the playroom while the other one played. We used to go back and forth to the nursery all the time to find clothes and other things we needed. Eventually I thought to myself, why don't we just bring the dresser and changing table out here? From this angle you can see the necessities that aren't as pretty -- the diaper genie, the changing pad, a wipe warmer, a bin full of baby medicines and diaper cream on top. We also put some hooks on the side of the dresser so we can hang clothes or PJs there while we are changing outfits. I am constantly looking for ways to increase efficiency and I try to think of systems that make things easier with the twins. Hooks are so helpful. Every night before bath time, I hang their PJs on the side of the dresser on those hooks. When Scott gets done bathing one of the babies, he knows exactly where to look for the fresh pajamas. The dresser has clothes, headbands, hats, socks, shoes and diapers. It's really full. We use every available spot! Obviously we removed the huge desk/table from the center of the room to give the babies room to play. 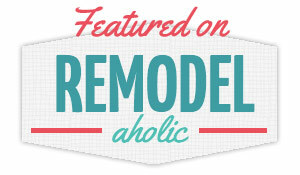 We also replaced the thrift store chandelier (one of my favorite finds!) with a simple ceiling fan. This change bummed me out, but this room was getting hot because of the windows. I also use this as my workout room so now I really appreciate having the fan. We lost something stylistically, but we gained functionality. We bought an affordable rug for the floor that tied in with the rest of the blues in our house because this room is visible from six other rooms in our house. It's smack in the middle of the home, so I really didn't want it to stick out like a sore thumb. We layered that with the rubber play mat, which I also bought to tie in with our blue/green colors. Plus I'm a sucker for polka dots, so I couldn't resist! 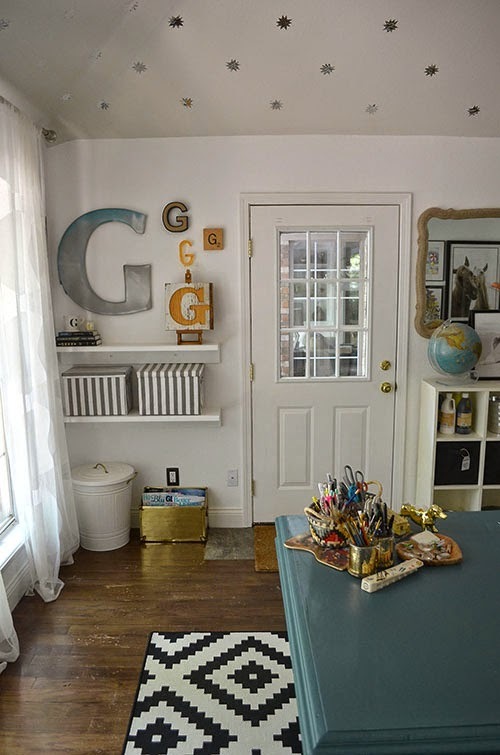 Our DIY letter bookshelf is one of our most popular projects ever, and I'm so happy that it works so well for the playroom. I filled it with their toys and stuffed animals, along with some other sentimental gifts. Can you spot the real dog down there? Next to the chair are too very important things: a basket to hold our books, and an air freshener. If you have two babies and change a lot of stinky diapers, plug-in air fresheners are your friend. Back when we fixed up this room originally, Scott built these floating shelves for the corner to house some of my art supplies. The shelves have new purpose now, and they're the perfect place to display toys when they aren't in use. I'm in favor of getting things off the floor, especially since I work out in this room in the mornings before the babies wake up. The white trash can houses our dog food, so that stayed. We still feed the dogs in here because this door leads to the backyard. Can you tell this room has a lot of different uses? We have to squeeze as much functionality into this space as we can. It's fun to see the same space side by side. 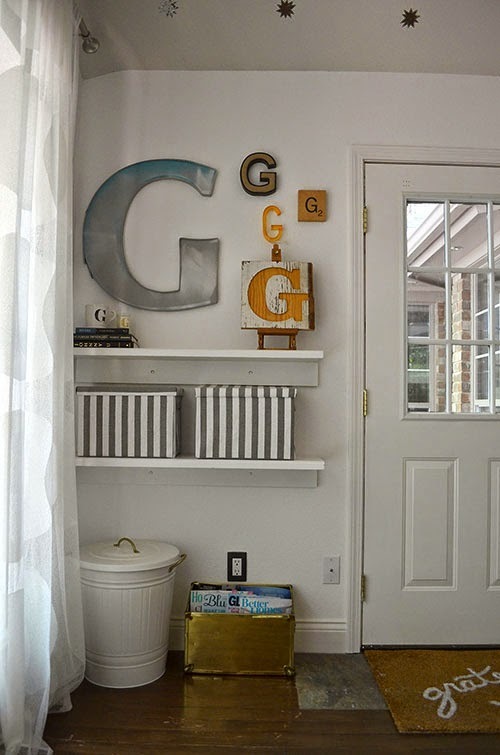 I love a good before and after, even if it's just shelves that are styled differently. See that tiny dustpan and broom hanging at the bottom? Between muddy dog paws and messy children, we have to be ready to clean the floors at a moment's notice. We tucked it away under the shelf to make it easy to keep the floor (kind of) clean. You can see a peek of the old Ikea cabinets that we repurposed as a window seat. Inside we have activity cubes and bins full of small items like rattles and teething toys. Lest you think our entire house is this tidy and organized, you should know that I took all of my art supplies from these cabinets and just dumped them on the bed in our guest room. That's another organizing project for another day! I can close the door and pretend like that mess doesn't exist. The wall with the back door is the same yet different. I guess that's the theme we have going on in this room. We spent very little money to change this to a nursery and tried to keep as much of the original furniture and storage pieces as we could. 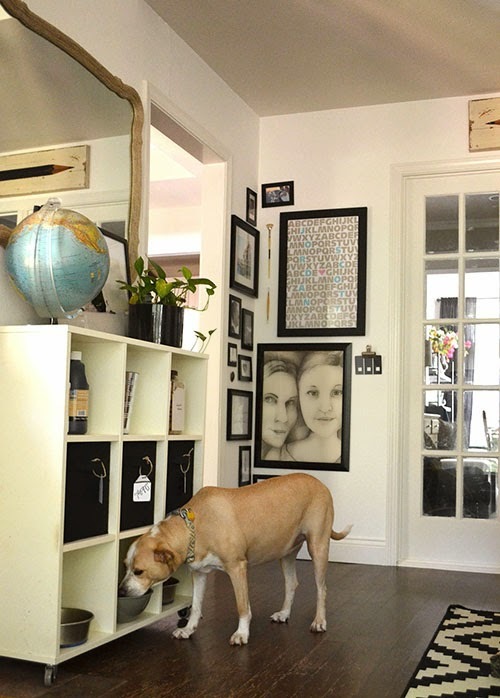 We already had this white shelving unit from Pottery Barn in here serving as storage and a dog food station. We removed the wheels as part of our childproofing efforts, and we added colorful bins. The TV from our master bedroom moved in here because we never watched TV in bed. Now we use this TV for workout videos, Sesame Street, football (when dad is on baby duty) and soap operas (when Grammy Jo is on baby duty). Everyone wins when the playroom has a TV! We've had the wire with photos above the door for a long time now, but we have swapped out the old photos for snapshots of the twins. Can you tell my OCD husband spaced them perfectly? I never would have done that! I love this animal art so much. They are gift bags I bought at World Market. I just cut off one side of the bag, removed the handles and taped it with washi tape. How easy (and cheap) is that? This storage cabinet is so useful. The bins store pajamas, diaper pail refills, wipes, dog supplies, our baby carriers and video equipment for my workouts. I've had those chalkboard labels for a while so it was nice to finally put them to use. We paired down the art in the corner to keep everything out of reach of tiny hands. We got that alphabet poster with our names as a wedding gift. I decided to keep it out here (it does have an alphabet, after all) but I colored over the twins' names with dry erase marker on the front of the glass pane just for fun. You can see more gift bag animal art over here in this corner. I'm such a sucker for artwork that features animals dressed in clothes. I swear I have 10 different paintings and drawing with that theme in the house now that we have children. It's sprinkled in the playroom, the nursery and the guest bathroom. I just can't help myself! Trust me: Don't go to Hobby Lobby unless you want to buy another painting of a llama in glasses and a necktie. I love this room so much. And thank goodness, because we spend a TON of time in here. It is worth the extra effort to make this room both pretty and functional so that we can all hang out in here and be really content. The best part is, the babies love it. They have room to roll around and wrestle and strew toys all over the place. What could be better than a piece of tupperware and some blocks? If you're considering transitioning one of your extra rooms into a play space for your kids, my advice would be to go for it. We are so happy having all of the baby gear in one spot instead of sprinkled throughout our adult living spaces like the formal living room and den. Keeping the mess contained helps us keep our sanity. It was the best decision we could have made. I'll be back soon to share some photos of the kitchen, guest bathroom and nursery so I can show you the babies are impacting our other rooms. These tiny kiddos have a lot of needs! I think it's a fun challenge to figure out how I can marry child-friendly functionality with my personal style in my favorite rooms of the house. It's a constant work in progress, but I'd love to share what we've done so far. Be back soon!